I am super excited to have Katja guest post today. Not only is her blog beautiful and inspiring, but she has an awesome giveaway this week that you definitely should check out! Welcome Katja and good luck everyone! Hi everyone! It’s Katja from Skimbaco and I’m so excited Andrea let me guest post here today about back to school shopping. I know what you are thinking, “is it already the time”, “can’t we just enjoy summer”, and “I’ll just shop when the time comes”, and you are right. You should be enjoying summer with your kiddos right now, and no, I don’t want to think about back to school time yet either. However, if you would like to save a little money and not spend a fortune on BTS clothing shopping, now is a very good time to save money while getting the clothes your kid needs. Here are 4 reasons why shop now, even if you’d rather be at the pool. 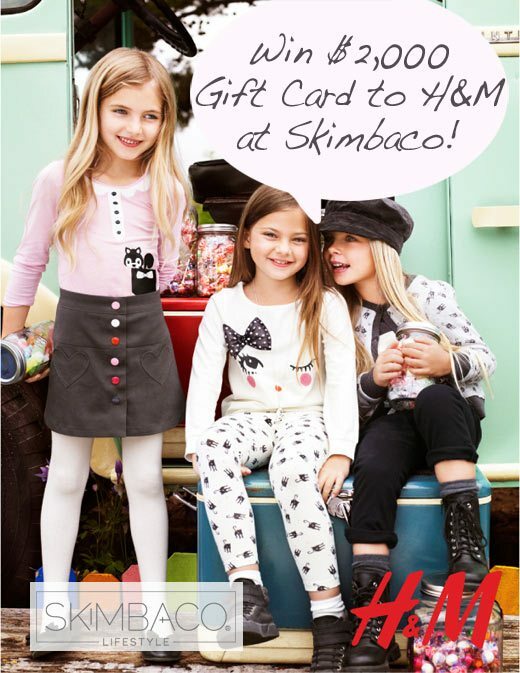 Or you can just try your luck and enter to win $2,000 gift card to H&M in my blog, and get the entire year’s worth clothes for your kid that way. And not just that the correct sizing or style will sell out, but if you start looking for the stuff she/he needs when she/he does much later this fall; you end up paying much more than you would like to. You know that moms are smart; the clothes with best price-quality ratio will sell out first, and either you are left with stuff you’d never buy or clothes that are out of your budget. School are not in yet, so all of the stores are having huge pre-season sales right now, and the prices are the lowest plus the selection is the best because the fall clothing collections have just hit the stores. While many stores might not have visible in-store sales, you can find great pre-season sale coupons, for example H&M offers 20% off coupon for shopping for kids clothes until August 14th. Going to school for the first time, or going back to school can be very scary for your kid. Shopping together for clothes and school supplies can be a great bonding opportunity and to talk about school and possible worries about it. Since it’s not back to school time quite yet, it can be less pressure to do it now, and you can reassure your child that he/she still has some summer vacation left too. I try to take each kid (I have three!) shopping alone with me, and we make it a mommy-kid date combined with going to movies, getting a haircut or eating a special dinner just two of us. Enjoy your summer and try to make back to school shopping fun this summer!